You are currently browsing the category archive for the ‘Matthew Kaner’ category. I had a fantastic time meeting and passing on a few handy tips to the 2013 participants of the Panufnik Scheme this morning, which reminded me that I haven’t written a blog post since I wrote my first three minute piece for the scheme, which was now nearly two years ago! Since then I’ve completed a brand new piece for the orchestra, a 10 minute commission that will be workshopped on 11th April at LSO St. Luke’s, followed by the full premiere in September 2013 in the Barbican. 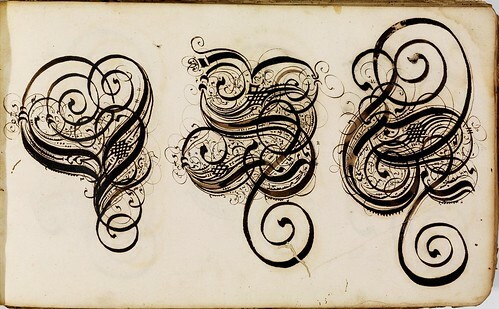 It’s called The Calligrapher’s Manuscript and is inspired by the remarkable calligraphy of 17th-century master Johann Hering, which has only recently come to public attention through its online publication on the Bamberg State Library website. As you’ll see from some of the images below, the manuscript in the Bamberg Library is not a conventional artefact in any way. 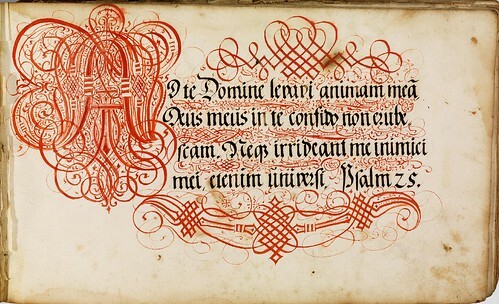 Most calligraphers from this period would produce copybooks or modelbooks for students to learn their craft from, whereas Hering’s album seems to have been intended purely for private study and experimentation. This means that a number of the designs are incredibly elaborate, and towards the end, almost completely abstract. In the first movement of my piece (which lasts 5 minute or so), I worked on the idea of a ‘main text’ adorned by a continuous elaborate layer of filigree, as found on many pages of the manuscript. (You can see a fairly typical example of this above.) Each of these pages begins with a very enlarged and highly decorated single letter, which sets the tone of the remaining filigree surrounding the body of the text. At the very opening of my piece, therefore, very detailed decorative figuration forms the initial foreground, but from this texture, melodic fragments gradually begin to emerge, until they coalesce into a clear melodic line, which becomes the focus of the rest of the movement: the ‘main text’, if you will. 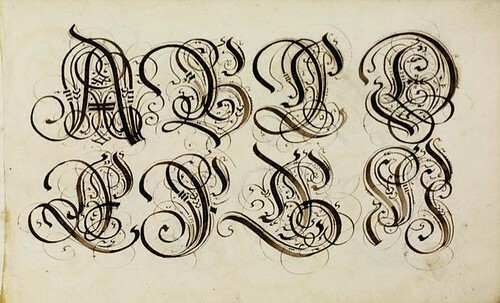 Nevertheless, this main line still continues to interact with the layer of decorative writing that almost constantly surrounds it and occasionally, rather mischievously, lurches forward to take the limelight. In the second movement, I took a contrasting (but musically related) approach. 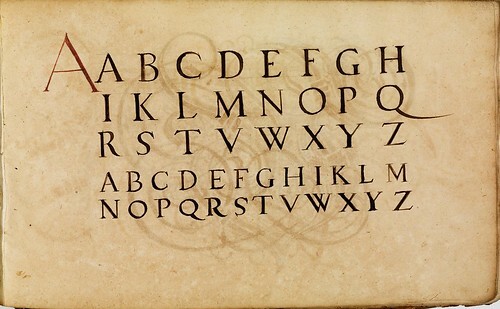 Here, the gradual transformation of a very straightforward rendering of the alphabet into extremely decorative, and eventually purely abstract designs in Hering’s manuscript was the inspiration (see the images below). This manifests itself as a simple harmonised line in the strings that repeats and evolves throughout the movement, but is gradually joined by other melodic figures in the woodwinds placed in counterpoint against it. These superposed woodwind melodies appear more and more frequently as the movement continues, and themselves become more and more ornamented until a climax of activity is reached, with several layers of extremely decorated lines sounding against one another simultaneously. Whilst at Tanglewood this summer, the other fellows and I were required to write three short pieces in as many days, each for a different combination of duos, the first of which was for Violin and Viola. I sneakily took this as an opportunity to try out some musical ideas that I knew would relate to what I wanted to do in the second half of my orchestral piece; so if you have a listen, you should be able to hear the process of ever-increasing decoration that I describe above (in a much smaller chamber music format of course!). I greatly enjoyed yesterday’s Panufnik Catch-Up afternoon at LSO St. Luke’s. As a composer, I do suffer from a tendency to become completely over-ensconced in the intricacies of my music, usually with the admirable intention of shutting out all external pressures and focusing as clearly as I can on the task in hand. Though many of the ideas for my piece are now quite developed, the material itself always seems to come to me in a rather rough form at first; it takes a lot of painstaking work to sculpt these initial inklings of ideas into the musical objects I’d actually like to use (or at least don’t hate). Sadly, this crafting process has always been very challenging for me — despite the fact I’ve been through it so many times now — but there is a good reason for it be difficult. None (or at least very little) of what I do is controlled by systems; each chord, instrumental colouring, melodic contour and so forth, simply has to be judged by ear and with my imagination. Nothing else seems to produce satisfactory results. Furthermore, I am constantly aware of the need to get ideas right from the beginning — the structure and materials for the rest of the piece may well depend on it! As frustrating as this may all sound, I am in very good company in this respect. As Colin Matthews pointed out during our group discussion yesterday, Debussy turned down a commission for an orchestral piece, simply for the reason that the one month they’d allowed him for the composition of the score, was roughly the time it took him to get from one chord to the next! However, making what seem like such big decisions about often very tiny details, and thinking quite so critically about the implications of these decisions, inevitably has a wearying effect. I was therefore, rather unsurprisingly, delighted to leave my flat yesterday to meet with the other composers and organisers on the scheme, and to work closely with some fantastic players from the orchestra. As well as the obvious benefit of simply introducing some fresh air into my system, I really enjoyed the opportunity to discuss other works that meant something to each of us, and was absolutely inspired by seeing the players take us through the workings of their own instruments. It is (perhaps) strange, but the more you learn about orchestration and instrumentation, the more you notice the inadequacies with the well-known orchestration text books. There is simply nothing like bringing a passage to an instrumentalist (or group of instrumentalists) and discussing the problems and virtues of the material in person. And it is always after discussing these sorts of practicalities and absorbing the musical points of view from various different members of the group that I personally find myself engaging with the task ahead with a renewed spirit and fresh enthusiasm. So now I seem be teeming with ideas, full of solutions to problems I was struggling with until this point, and in possession of a huge listening list of pieces I’d forgotten about, not thought of as being directly relevant, or not even got round to playing yet. Indeed, this whole process has reminded me how important it is for us composers to break out of our shells, at least once in a while, both for the sake of maintaining our sanity, but more importantly, so that we can get on with task in hand in a way we actually enjoy. For this reason, I’m incredibly excited about hearing Bernard Haitink rehearse and perform Ravel’s Mother Goose suite with the orchestra next week; one of the finest transcriptions of a piece originally for piano duet I’ve ever come across. I’m particularly looking forward to hearing the famous contrabassoon solo in ‘Les Entretiens de la Belle et la Bete’, and hopefully having a chat with the player, as the next passage I’m writing will now feature this instrument quite prominently.